Credit card processing companies are notorious for the technicalities and complicated procedures that allow them to arrive at specific pricing structures. But, understanding the fundamentals of the bankcard system can help you avoid fees and find the best credit card processor. It is critical to understand everyone who is involved in the credit processing system. Each plays a role in the credit card processing operation, and more people and businesses make it possible than meets the eye. Cardholder — Most people own a credit card, so you are probably already aware of what responsibilities come along with having one. Holders can use their card to purchase products and services from most merchants. Merchant — Any business that sells goods and services is a merchant. But when it comes to the credit card industry, we want to focus on those who consider credit cards an acceptable form of payment. By opening a merchant account with a credit card processor, they can accept debit and credit cards for any goods and services they may be providing. Acquiring bank — An acquiring bank, or the merchant’s bank, is a bank that registers with the key players of card associations such as Visa and Mastercard. Their role in credit card processing is to contact merchants to urge them to create accounts or aid them with maintaining their membership. To do their job well, they provide merchants with the software and equipment they need to accept cards at their establishment. They also offer customer support and are responsible for depositing funds from card sales into the merchant’s associated account. With the help of membership service providers and third-party sales organizations called ISOs, they play a role in conducting and monitoring the daily activities of their customers’ merchant accounts. The acquiring bank’s job grows easier as the bankcard system sees more innovation. Issuing bank — As its name suggests, the issuing bank is the one that distributes credit cards to consumers. Like acquiring banks, they also are members of significant card associations. There are also some aspects that are different. Issuing banks must pay acquiring banks for the purchases card users make. The cardholder then repays the issuing bank under the terms they signed when taking on the responsibility of obtaining a credit card. The issuing bank takes a more hands-on role compared to an acquiring bank, and does most of the work themselves. Card associations — Visa, Mastercard and other card associations are not responsible for issuing cards or maintaining merchant accounts. Instead, they oversee financial institutions, ISOs and membership service providers by making sure credit processing and electronic payments are working as expected. They do their job by instating qualification guidelines for their members and by acting as an intermediary between all the players in the credit card processing industry. The association makes sure that the money is transferred from the acquiring bank to the issuing bank for each transaction. By maintaining and improving the cards’ networks and capabilities, the card associations, in turn, make a profit. Each company uses a unique system to achieve these goals. EMV card reader — EMV chip cards are a piece of technology that has been rapidly increasing in prevalence nationwide over the last few years. Due to the increasingly innovative ways cybercriminals are conducting widespread data breaches and creating counterfeit cards, card issuers have developed new methods to protect consumers from falling victim to fraud or getting their hard-earned savings stolen. This step forward has caused merchants to add new in-store technology and credit card machines that support EMV chip cards. Consumers’ banks likely urge them to upgrade their cards. If you do not have one already, EMV cards contain a computer chip that appears as a little metallic square. They are replacing the traditional magnetic stripes that are easy to steal or duplicate. The difference between magnetic stripes and the new computer chip is that if someone copies a magnetic stripe, they can reproduce the data on the card repeatedly because the stripe contains static information that doesn’t change after each transaction. In contrast, the EMV card that includes the chip generates a unique code that is exclusive to each transaction. This chip denies hackers the ability to profit from stolen information and significantly reduces the chance of fraud. These chips require a few more moments of patience than their swiping counterparts. However, the tradeoff is that consumers will no longer have to master swiping in the correct motion and orientation. The typical EMV chip transaction takes roughly 15 seconds to complete. Barcode reader — Barcode scanners are electronic devices that read barcodes for in-store products. These devices work by using a lens and light sensor that translate what they capture into an electrical code. The barcode scanner then sends the image data back to an output that allows for items to be processed and rung out at any physical location. They provide much more utility compared to a standard cash register. A barcode scanner combined with a point-of-sale, or POS, system increases efficiency by speeding up the checkout experience. The tool also improves accuracy and negates the chance of a manually entered error in a system. Automating the checkout experience allows for perfect inventory control that tracks stock in real time. Before recent advancements in technology, these devices were basic, stationary and needed pairing to a specific computer or program to function correctly. They required unique cords that weren’t easy to replace. Nowadays, scanners come in many forms and can adapt to any businesses needs and preferences. Handheld barcode readers provide more ease of use and can reach barcodes in challenging places. Smartphones also can scan barcodes, but should only see use when a better alternative is not available. Finding the right barcode scanner that suits your needs will help you manage prices and transfer data better than ever before. POS terminal — A POS machine is the hub that connects all the other aspects of an in-store system. The device reads information off customers’ cards, checks their accounts for sufficient funds, transfers funds between the customer and merchant, records the transaction and sends a message to the printer to produce a receipt. The most powerful POS machines include a touchscreen that allow for convenient use by employees. The screen faces employees, enabling them to use on-screen buttons to navigate through options during checkout. Some POS’ even include a customer screen that shows details about items, prices, discounts and advertisements. Receipt printer — Modern digital printers that generate receipts use thermal technology that produces an image by heating special heat-activated paper. They can achieve different colors by heating the paper at different temperatures. Older means of printing receipts used dot matrix printers, but these faded out of use due to being loud, clunky, slow and power-intensive. They worked through the use of pins and wires to print characters on paper. Thermal receipt printers work seamlessly with POS systems and provide numerous benefits to a business owner. In addition to faster printing speed, they also require less maintenance. Since they have fewer moving parts, there is less chance of them breaking or jamming. Paper is the only required purchase for a thermal receipt printer, since it does not use ink. Keeping maintenance costs low is a vital aspect of a successful establishment. Cash drawer — Cash drawers store currency and other valuables that work in conjunction with the rest of the POS system. They have improved by leaps and bounds, and now can track sales and recognize when one happens. To prevent theft, they require individual instruction to open. A cash drawer should also be sturdy and immune to breakage to prevent criminals from being able to easily pry the locking components open and steal what is inside. Now that we understand all the roles within the credit card processing industry, how does credit card processing work? First, once the customer has decided to use a card as a form of payment for their transaction, they swipe or insert their credit or debit card in the merchant’s machine, depending on whether they have an EMV chip card. Once the merchant’s database has considered the cardholder’s means of payment as acceptable for the transaction, they collect the payment information physically using an in-store credit card reader or an online system if the customer is shopping online. Next, the information gets sent to the card network, such as Visa or Mastercard, which acts as a middleman between the customer and their bank. Once the consumer’s preferred bank receives the request, they double-check to ensure the purchase is not fraudulent, and that the customer has sufficient funds to complete the payment. Banks can typically detect issues including insufficient funds, maximized credit limit or a suspected non-authorized user. Once they have conducted their tests, they send a signal back to the credit card processor that approves the transaction to go through. Once the transaction reaches this point in the flow of information, the merchant and customer receive a notification whether the payment has gotten accepted or denied. But, what exactly happens when a credit card transaction gets declined? More often than not, it is not the customer’s fault when a card decline happens. Banks and retailers take extensive measures to prevent fraud and stop scammers, as well as issues with a faulty system. These issues are another reason why choosing the best possible POS solution is essential for your business. Even with an approved transaction, the funds do not leave the cardholder’s possession quite yet. The next stage is the clearing and settlement phase. This process is similar, but more drawn-out than what has already happened. Over the next few days, the credit card company and merchant take steps to ensure the process complies with approved procedures. The day’s charges send in batches to the cardholder’s acquiring bank, which will appear on their monthly credit card statement at the end of a business day. The processor then routes the merchant-provided information directly to the credit card company where settlement occurs. The approved transactions get forwarded to the issuing banks of each customer, and the funds then get officially transferred after deducting fees. The fees go to the banks and processors that played a role in making the transactions possible, and the percentage deducts from the merchant’s account. After this process is complete and the transaction information appears on the customer’s statement, the credit card processing cycle concludes. Today’s retail customers expect stores to offer the utmost level of convenience. 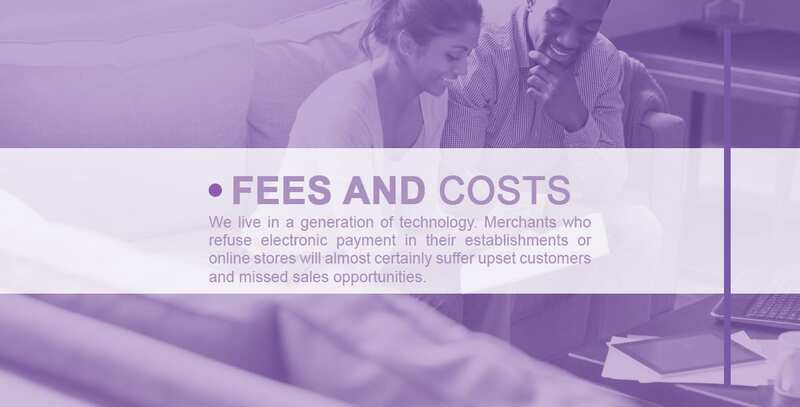 Merchants who refuse electronic payment in their establishments or online stores will almost certainly suffer upset customers and missed sales opportunities. However, in many scenarios, merchants require spending a minimum amount to allow the use of a debit or credit card. While customers may think this is just a ploy to get you to dish out more of your hard-earned cash, there is more to it than that. Merchants pay a fee to be able to accept credit card payments. To compensate for these charges, they often require a minimum spending amount, mark up prices or seek the least expensive credit card processing rates to absorb these costs. Credit card processing rates vary depending on the medium the merchant is using to sell their products or services. These mediums most commonly include retail, e-commerce or phone sales. The rates occur in several ways, which include flat fees, volume-based fees or per-transaction fees. There are two major costs of credit card processing: merchant discount rate and chargebacks. Merchant discount rate — If a merchant accepts card payments, the credit card processing company takes a percentage of sales for their service. Fees for retail stores typically range from 2 to 3 percent of the total purchase price, while online stores can be pricier, and are usually more to the tune of 5 percent. Several elements comprise these prices. An interchange fee is a charge acquiring banks and processors must pay to the issuing bank. Most of the time, credit card networks such as Visa and Mastercard decide these fees based on market research, and generally update them biannually. Interchange fees combine a flat rate with a percentage of the purchase price. Credit card networks also charge assessment fees when merchants’ customers make transactions with their cards. This charge correlates with the total transaction volume for the month, and a percentage of that value deducts from the merchant’s funds. The fixed fee with an added percentage is a common way of charging assessments, but the merchant’s acquiring bank can seek companies with the best rates, or may find luck negotiating with their current partner for a better deal. Markups on interchange and assessment fees cover the cost of the acquiring banks and processors that facilitate the card transactions. These charges usually make up around 20 to 25 percent of the total card processing cost. Different merchants prefer particular pricing models. Research and proper negotiation allow them to find the best prices available and arrive at a sustainable plan. Chargebacks — If the customer desires to dispute a charge on their billing statement they believe is unwarranted, they reserve the right to do so within 60 days of the date of the settlement. If an issuing bank receives a valid complaint from one of their customers, the merchant charges between $10 and $50 as a “retrieval request.” The merchant has a specified amount of time to respond to these requests. If the merchant ignores the notice or does not act in time, they can suffer even more fees. They also can appeal the request, but it is a long and drawn-out process that generally favors the customer who issued the complaint. If the merchant loses or admits fault, the issuing bank will replenish the customer’s bank account with the amount of the suspicious transaction. Cash Discount Program — Generally, it is good practice for merchants to avoid charging their customers additional fees. But why should customers paying with cash pay the same price as those paying with credit cards that come with processing costs? The typical resolution for merchants being charged card processing fees was to charge card users a premium to make up the difference. But cash discount programs are becoming more widespread across the nation and are viewed as a much better solution than their predecessors. Cash discount programs offer bonuses to anyone who chooses to pay with cash or check in a merchant’s location. This incentive can offset credit card fees and has shown great success regardless of the industry it’s used in. While there is no way to zero out credit card fees, you can avoid passing the additional costs to the consumer and reward those who use other payment methods. NRS offers two different low-rate options, including a simple flat rate that does not leave you guessing what the final payment price will be, and custom rate options for businesses that process over $10,000 a month in credit card transactions. We work to save you money and find the best possible option for your particular operation. Deciding to go with NRS provides additional benefits. A three-year agreement will provide you with a free credit card reader as an added value and a thank you. Payment processing for small business does not need to be a headache. If you want to see what specifically NRS can do for you, a free quote is just a click away. These features make NRS’ retail solutions the ultimate store management tool. To learn more about the benefits of the National Retail Solutions POS+ system, ask for a free quote today!